Bimal Roy is usually perceived as a director of serious films, light-hearted comedy is something that most do not associate with him. Though he never did direct a full length comedy film, at least I am not aware of any such film, he handled the comedy scenes in his films with the same finesse he did the serious scenes. I remember several comedians complaining how they never got well –written scenes, often directors would tell them “Aap kuch kar dijiye”, that means, 'please do something yourself.' Obviously doing something without any direction can be quite painful for anybody. In the past we were used to seeing comedy tracks in films, which ran parallel to the main story but had no apparent link to it, except at the end when the comedian joined the hero to bash up the villain and his henchmen. In Madhumati too there is a comedy track but here Johnny Walker, the comedian, is an integral part of the film. Bimal Roy never gave the comedians a raw deal, they were treated with respect and not as buffoons. This is apparent in Madhumati. 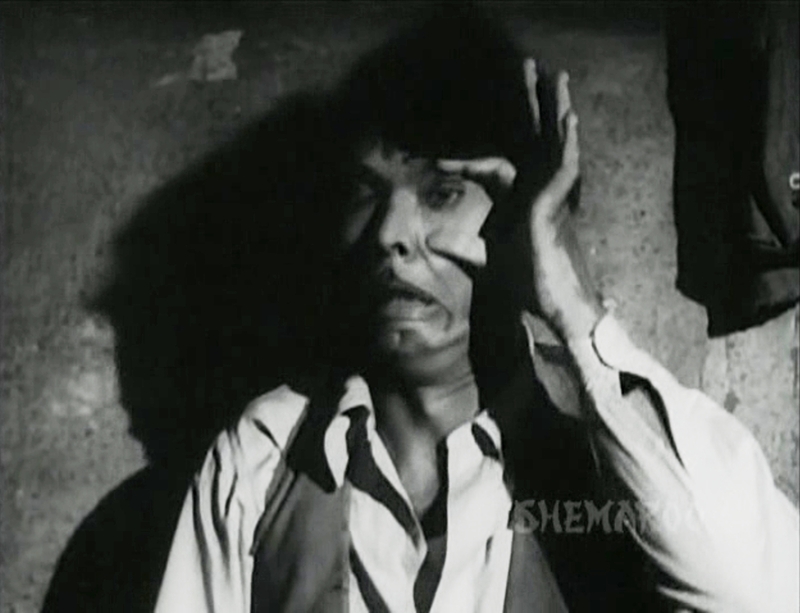 There is this very funny sequence where Johnny Walker is made to believe that his boss Dilip Kumar is possessed by a ghost. 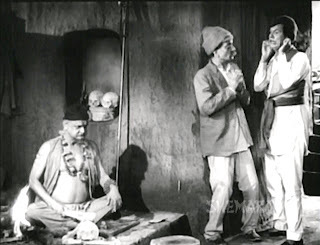 It is very well scripted, the dialogues are funny, for instance, the ojha (sorcerer) played by Bhudho Advani, remarks “main chote mote bhoot nahin bhagata”. (I do not get rid off small ghosts) . Later he asks for his fee a sum of Re1 and 25 paise when Walker gives him just one rupee, he warns him, “Do not blame me if 4 annas (25 paise was 4 annas those days) worth of ghost remains”. There is some superb acting by Johnny Walker and Bhudho Advani. Now just have fun while watching this scene but also watch Johnny Walker’s expressions and note how well the entire scene has been conceived. 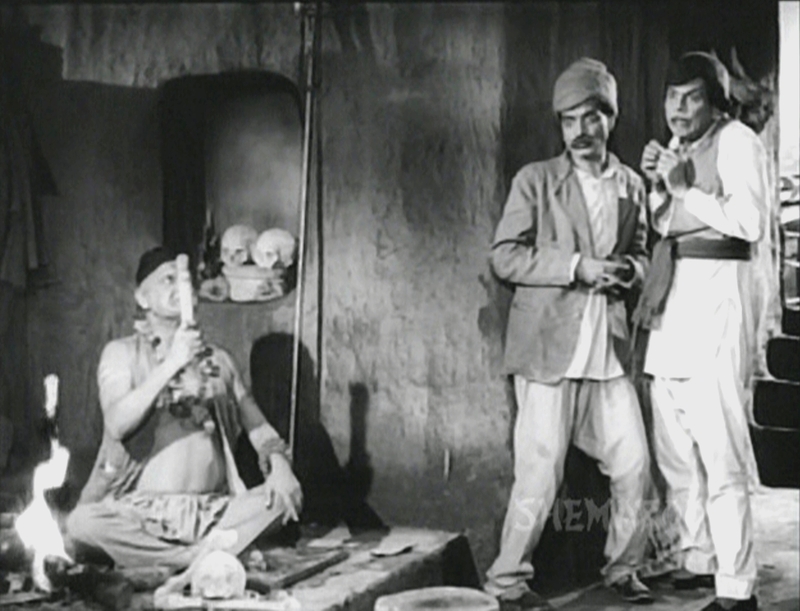 Another wonderful scene is the one where Johnny Walker shows off to a group of villagers, bluffing away but is sheepish once Dilip Kumar makes an appearance. I know for a fact that this is also the late comedian’s favourite scene or at least one of them, for he had talked at length about this scene in one of his television interviews. You might well say, the screenplay writer has written the script, the dialogue writer the dialogues and the actors have done a superb job, so how does the director get all the credit? Well, the director is the captain of the ship. A confused director often confuses his team and a good director gets the best out of his team. I remember my father sometimes came back home quite annoyed because the director wasn't sure about what he wanted or sometimes insisted on something silly. Once we were seeing one of dad's films and my mother remarked,"Why were you shouting so much?" My father replied,"The director insisted, he wanted some loud acting". Therefore for actors it was a real pleasure to work with a director like Bimal Roy, he got the best out of his team and often gave some useful tips to his actors as well. Bimal Roy was probably one of the few directors who had the guts to record an entire song but shoot only a part of it. It is the scene where Pran is enjoying a mujra and Dilip Kumar barges in to confront him demanding to know where Madhumati has disappeared. The entire song ‘Hum hale dil sunayenge’sung by Mubarak Begum was recorded, but Roy decided to have Dilip Kumar interrupt the song and dance sequence. It made sense, for any person, who is seething with rage will not wait for the song to end before making an entry. I am sure most directors would wait for the song to end. The song was quite a hit song and although we never got to see the entire song on the screen, we did hear it on the radio. There were a number of songs in the film and the film was getting to be too long so Roy was toying with the idea of editing out 'Jungal mein more naacha kisine na dekha'. My father requested him not to do so, for a Johnny Walker song those days meant you had a sure hit on your hands. Take a look at Vyjantimala's footwear (below). I was struck by the director's attention to detail, it is not the usual pair one would see in the cities, it is quite different. Vyjantimala's character Madhumati is from the hilly regions, so I guess the inspiration for the shoes came from those regions. Finally something quite terrible happened during the film’s outdoor shooting, enough to drive any producer/director up the wall. Unnoticed by the camera crew, on one particular day, the camera lens cover remained on the camera, nobody had remembered to remove it , it was at the end of the day that they realized the blunder. This meant that nothing had been filmed, an entire day’s shooting gone down the drain. But Roy was an extremely patient man, I have heard that he did not lose his temper, he just accepted what had happened and re-shot the scenes the following day. To know more about Madhumati then you should take a look at Rinki Roy Bhattacharya’s book Madhumati – Untold Stories From Behind the Scenes. While most writers just stick to biographies hardly anyone tackles a behind scenes story. I find that surprising because I have seen how interested people are in such stories. This blog for example still gets a lot of hits although it is more or less inactive. I always felt that while we still have some of the old timers around, writers should take the effort to put on record all that went into the making of the old masterpieces, it would be sad to see all that knowledge being lost to the passage of time. Rinki Bhattacharya takes us on an interesting as well as emotional journey as she goes in search of the untold stories of Madhumati. She notes in her preface to the book that the idea of the book came to her when she was planning Madhumati’s Golden Jubilee celebrations. She has obviously worked quite hard at getting all the facts. Meeting people not just in Mumbai but she went all the way up north to the hills deep into the far flung towns and villages seeking out the locations where Madhumati was shot and also meeting the local people who were witness to the shoot and who had the their own memories to share. There are interesting bits of information and anecdotes. A journalist Taran Khan for instance recalls how her aunt almost caused a scandal when she rushed to meet Dilip Kumar without wearing a duppatta on learning that the star was shooting in the vicinity of her grandfather’s estate. For me personally what I found interesting was that I finally learnt where the scene featuring my father and Dilip Kumar driving up the hills was shot. It was shot on one of the many hairpin bends on the old Khandala Road in Maharashtra, this place served as a double for the Kumaon hills. With this post I come to the end of my posts on Bimal Roy, the director. 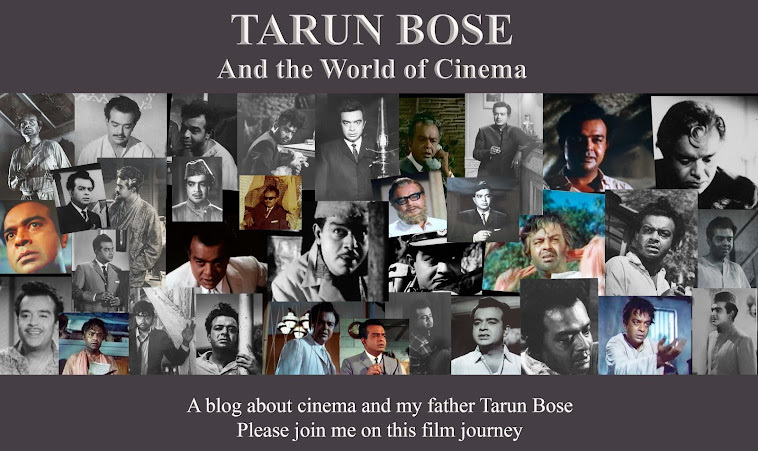 My next few posts will be on the films that were produced by Bimal Roy but not directed by him and of course they will be the one's featuring my father. So many new interesting facts about the film and its making! Thanks Shilpi for sharing it with us. Thank you Harvey, I am so glad all of you find my posts interesting. Once again, so wonderful to read these posts, Shilpi. There are so many interesting anecdotes and angles you come up with. Thanks so much for this - it was a great pleasure reading it. Your most welcome Raja. I am glad that you find pleasure in reading my posts and for me these comments are very rewarding. Shilpi, I really look forward to reading your posts. You always offer such interesting insights into film-making, things that aren't immediately obvious - for instance, that bit about the song being interrupted. So true, someone who's in a rage will not wait for the song to end! I have always liked Bimal Roy's films a lot, but your anecdotes about him are making me respect and appreciate him even more. I really look forward to reading your posts..Now that is a comment every blogger really, really looks forward to, I am sure you agree with me Madhu. I hope I am able to live up to everyone's expectations with my future posts. The comedy scene that follows was well written with sharp dialogues. I too like that scene of Johny Walker boasting away to his friends. Oh dear. Imagine all that reshooting. Yes pacifist, so many things happen behind the scenes that most of us are unaware of, I wish my parents were around or at least some of my father's colleagues, I would have got tonnes of behind the scenes stories. Thanks Anu and I really liked the fact that your father understood Bimal Roy's vision. Hope you continue to enjoy my future posts. There is so much for me to catch up on here on your blog. I seem to have entirely missed out on your Bimal Roy series; have been rather out of circulation for awhile now. Will return soon with my comments, and meanwhile love the photo collage on the top. Thanks Nivedita, looking forward to your comments. Hey Shilpi like always njoyed reading this part too, my what a way you have have of letting us know the beauty of Bimal Roy as the Director, indeed i would say the finest one among his peers. Thanks Rajee glad you are enjoying my posts. Awesome Shilpi ji. Love the way you watch movies, the kind of small things that capture your attention. Lovely read. Shilpi thank you so much for pointing me at your post. It has been wonderful to "meet" you this way through Madhumati, especially after hearing a lot about you from Greta. I have enhanced appreciation for the craft of this film after reading your comments about it. Bimal Roy's attention to detail - and yours, by the way - is astonishing. While watching the film and being absorbed in it one has the gestalt sense of a more polished and thoughtful product than many other films of the era. In reading your comments about background score, framing of shots, use of costume, and so on, the details that give that overall sense begin to resolve into view. Also your mention of the Johnny Walker thread in the film, of its quality and integration, echo discussions I had about how this film had a bit of a masala feel relative to Bimal Roy's other movies. I look forward to learning more from you! Please do not use any material from this site without my permission and without giving a link back to this site. The copyright of all the screen captures and video clips of the films discussed here belong to the owners of their respective films. The screen captures and video clips featured in this blog are for the purpose of film appreciation and hence are academic in nature with no commercial objective.